L&T Manufacturing, Inc. designs, assembles, and distributes 2 & 4 cycle precision go kart racing clutches. We provide a high quality, champion proven, low maintenance racing clutch that you can be assured will perform consistently all day long. Our shop is located in Dayton, Ohio with national and international distributors who will help you find the right clutch for your racing fun and success. L&T clutches were designed and first manufactured by Tony Miglizzi in Azusa, California. He saw a need and wanted to bring to the karting world a durable and dependable clutch that would last and perform up to his standards. Because of his knowledge and enthusiasm, along with his attention to precision and detail, the L&T clutch soon became highly successful on the racing circuits. After Tony's passing, the company struggled to continue without the main force behind it's success. Carolyn Hudson, Tony's dedicated office manager, did her best to carry on the L&T legacy for the Miglizzi family until a new owner for the business could be found. 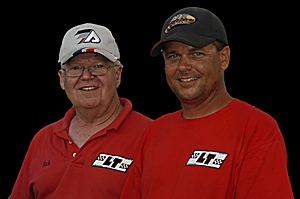 In 2003, Rick Robinson of Dayton, Ohio, who began his family's karting experience with Ohio Valley Karting Association (OVKA), purchased L&T Manufacturing. He retired from his job the following year and decided to move L&T from Azusa to Dayton. His son Jeff Robinson, an experienced toolmaker, works with Rick in the new shop. We are dedicated to continuing to offer the same reliable clutches and parts that Tony developed for the karting community, along with plans for adding new designs and products in the future. Thanks to all of our karting customers for being patient during L&T’s transition. We look forward to many more exciting seasons in the winner's circle.